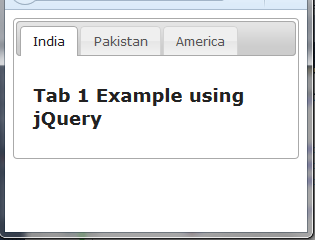 This article will show you how you can create tab control in asp.net using jQuery. 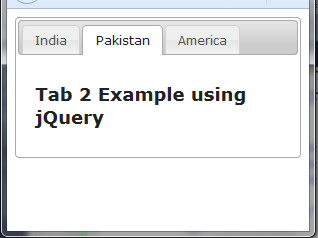 In this I will show example of three tab with different tab name. Some of my previous articles are as follows: Validation for Accepting Terms and Conditions Checkbox in Asp.Net MVC Using jQuery, Disable jQuery UI DatePicker Calendar On Button Click In Asp.Net, Draggable GridView Using jQuery in Asp.Net, jQuery Datepicker Calendar With Multiple Months in Asp.net, Autocomplete Textbox Using jQuery In Asp.Net and C#.Net, jQuery Datepicker Calendar Open On Image Button Click in Asp.net, jQuery Datepicker Calendar With Restrict Date Range in Asp.net. So for this article first I I will create a new asp.net application and add the below jQuery library reference in page header. Now add the bellow code into header of the page to create a tab. Now check the below complete code to show tab control. In above code I have created li control with div assign, the tab value. Now we have done run the application to check the output. How i can edit this style?